Posted on Thu, Jan 12, 2012 : 11:53 a.m. Ambassador Bridge Co. owner Manuel "Matty" Moroun and the executive who leads the company that owns the bridge, Dan Stamper, were sent to jail this morning after failing to complete a construction project to connect the bridge to local freeways, according to several reports. 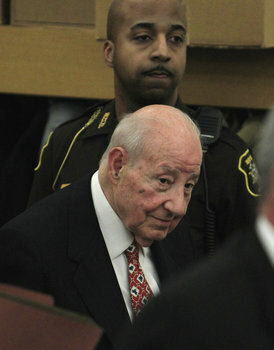 Detroit International Bridge Company owner Manuel "Matty" Moroun stands next to a sheriff's deputy before being led to jail today. A Wayne County judge ordered the executives to jail, dismissing a last-minute assertion that Moroun and Stamper had resigned from leadership of the company, according to reports by the Detroit Free Press, Detroit News and Huffington Post Detroit. Judge Prentis Edwards said "it is clear" that the Detroit International Bridge Co. “does not intend to comply with the court order” to complete construction on bridge gateway project, the Free Press reported. The dispute is separate from the battle over whether the state should authorize the construction of a second bridge from Detroit to Canada. Moroun has waged a fierce battle, spending millions of dollars on advertising to mobilize public opinion against a new bridge — which Gov. Rick Snyder and all the major auto companies and business groups say is necessary to handle future increases in traffic. Even most conservatives believe that international bridges should be owned by the Government, not corporations. Take the Ambassador with eminent domain and dispatch the silliness that surrounds this circus. Thu, Jan 12, 2012 : 11:10 p.m.
Mr Moroun wants everyone to drive by his duty free store and buy gas. If he completes the ramps, he loses a cash cow. Figure an average car gets 3 gallons of gas (most skip the station, but many stop) and Mr. Moroun gets $2.10 in profit from those gallons (about 70 cents a gallon in taxes he does not have to pay, but charges at the pump anyway). Then add sales in beer, wine, spirits and other products - also untaxed but sold at almost retail and you get another $5 a car or so in profit. I use the Blue Water Bridge most of the time ($2.50 a trip rather than the $4.50-5.00 for the Ambassador Bridge) and I don't have the truck crossing issues, or the stop lights in Detroit and Windsor. It is a pure greed decision not to finish the ramps. To the tune of probably $100,000 a day. Fri, Jan 13, 2012 : 12:35 a.m. Exactly. It would seem to me, we should do what is done to other criminals. Take the proceeds of their illegal activities. If he illegally sold drugs they would take that cash, if he were out picking up hookers, they take his car, why shouldn't his illegal activity fall under the same statutes. Oh never mind, I forgot, rich people crime over poor people crime. Thu, Jan 12, 2012 : 11 p.m.
Thu, Jan 12, 2012 : 10:57 p.m.
Thu, Jan 12, 2012 : 10:33 p.m. This is likely the first time in U.S. history that an American billionaire has been jailed. Thu, Jan 12, 2012 : 9:30 p.m.
Hooray privatization! This guy is proof that when you let business control vital resources, such as access in and out of a country, the public interest will not be served. Thu, Jan 12, 2012 : 9:59 p.m. I wonder if sentencing for crimes increases as prisons are privatized. Thu, Jan 12, 2012 : 8:01 p.m. I'm a private property guy, but it will be a good day for SE Michigan once Moroun finally croaks. No way they should they ever allow him to build a second bridge span. Thu, Jan 12, 2012 : 7:56 p.m.
As punishment, he should be forced to live under his rickety, crumbling old bridge for one year, or until it collapses, whichever comes last. Thu, Jan 12, 2012 : 7:19 p.m.
As if we needed any more evidence that private ownership of critical infrastructure like international bridges is a terrible idea, here it is. How this absurd situation ever occurred I have no idea. Time to get started on the new bridge I'd say. Thu, Jan 12, 2012 : 6:29 p.m.
Thu, Jan 12, 2012 : 6:10 p.m. I wish he'd build a pedestrian bridge in Ann Arbor. Then he could create a dirty campaign to outlaw pedestrian crossings. I thought they took your cell phone away when they locked you up? Thu, Jan 12, 2012 : 5:50 p.m.
Matty Moroun, is a brilliant wonderful man. He does not deserve this type of treatment. What happened to America... where we are free to make a living and live the American Dream???? Mr. Moroun has helped may people in his lifetime and I admire him tremendously. Thu, Jan 12, 2012 : 10:18 p.m.
Manny the Moron went to court over this issue. HE LOST. He was told he MUST complete the project at his expense. He made the choice to not comply. It is basic and simple. This is finally a judge holding wealthy people accountable for their actions, or in this case inaction. I hope this &quot;brilliant man&quot; spends the rest of his miserable life in jail, then the state should foreclose on the property he owns. I would then ban every single one of his trucking companies from using any bridge to Canada. I think that would make an expensive trip for him to head up to Port Huron or Buffalo. This guy has a monopoly. Rot away Manny. Thu, Jan 12, 2012 : 8:15 p.m.
Ms. Jennings, how much did you get paid to post that comment? Thu, Jan 12, 2012 : 6:09 p.m.
We are free to make a living, which Matty has done better than most. What we are not free to do is ignore the Law, no matter how good a living we may make. He is a scofflaw and a (deleted prior to removal of post). Thu, Jan 12, 2012 : 5:58 p.m.
Thu, Jan 12, 2012 : 5:45 p.m.
about time. he keeps interfering with the plans for an international bridge. i'd think.... that when someone interferes with a sensitive international security location -- then that should involve the authorities, homeland security, etc. In the interests of public safety and homeland security, an individual or a company should not have that much power over a piece of critical international transportation/infrastructure. Thu, Jan 12, 2012 : 5:28 p.m. It is about time. I cannot imagine the State of Michigan allowing him to build another bridge when he has continued to thumb his nose at making the corrections to the bridge construction that was ordered years ago. He is a slum lord in Detroit, the devastated train station being only one example of his neglected properties. Thu, Jan 12, 2012 : 5:25 p.m.
Do I hear reason and support for a second bridge, free from private ownership and games? Thu, Jan 12, 2012 : 5:29 p.m.
An International border crossing shouldn't be privately owned in my opinion. It should be jointly owned by the 2 nations it connects. Thu, Jan 12, 2012 : 5:17 p.m. I was in Judge Edwards' court one year ago when Dan Stamper was sent to jail; I was present on an unrelated matter. Stamper was released within a matter of hours after finally complying with the order of the court. The Wayne County Sheriff's Department had transported Stamper straight from the courtroom in front of surprised onlookers. Attorneys for the bridge company had wanted Stamper free while the incaceration decision was appealed but Judge Edwards balked. This dispute has gone on for a long time. Judge Edwards has been patient and fair. I am at a loss to understand why the bridge company has been so recalcitrant. The issue that led to the first jailing last year was completion of construction and it is still not done. My guess is that Maroun will be released within hours after he gives in in to the judge. Thu, Jan 12, 2012 : 11:04 p.m. The reason to delay is to get all that traffic to drive past their duty free store - where they make almost 70 cents a gallon on gasoline (the amount of state, state sales, and federal taxes they don't have to pay and the price they charge compared to the other stations). If they finish the ramps, they lose most of that traffic. Thu, Jan 12, 2012 : 5:37 p.m. In my opinion, the answer to the question about why the bridge company has delayed is simply &quot;arrogance.&quot; Without fear of reprisal, Mr. Maroun has behaved very consistently, displaying a steady and reliable contempt for the law, the state and the state's people. It's all a big game to him; he operates with no regard for the law because he feels the law does not apply to him. I am happy to see the judge give him a wake-up call, and I sincerely hope he ends up there at least overnight. Maybe the judge will give him 30 days for contempt. Thu, Jan 12, 2012 : 5:15 p.m. They should put him under house arrest in the Central Train Depot he owns down in Corktown. Thu, Jan 12, 2012 : 5:23 p.m.